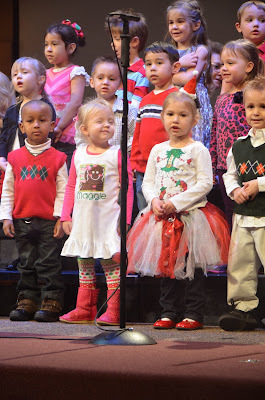 Maggie had her school Christmas program on Thursday afternoon. She did a great job! They sang lots of songs, but none of them were the traditional Christmas songs. I was really impressed with how well the kids knew the songs. You could tell they had been practicing. Before the kids got on the stage the director told everyone that the kids would wave to you and encouraged everyone to wave back. I really liked that because that is what all the kids want to do when up on stage. She would also wink, like in this picture. It was so funny!! Here are a few post from Christmas programs in the past.